What do you get when you combine lithium, zinc, copper, gold and cobalt? In today’s exploration climate... you get a fully diversified portfolio that could have significant upside. 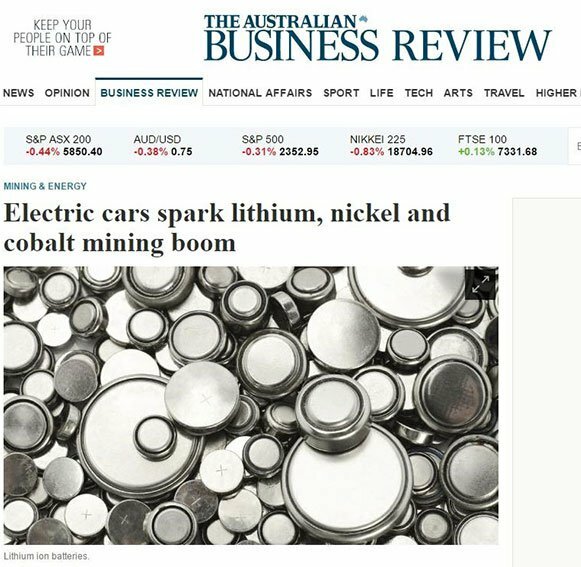 Lithium, copper and cobalt are all enjoying exceptionally high levels of investor interest right now on the back of the current energy revolution, led by the infiltration of lithium-ion battery energy storage systems. The importance of these metals in the manufacture of electronics and renewable energy products that utilise lithium-ion batteries (that’s basically all of them) is becoming paramount to the clean energy future. Electric vehicles, laptops, smartphones, battery storage products... each time one of these is made, there’s lithium, copper and cobalt involved. 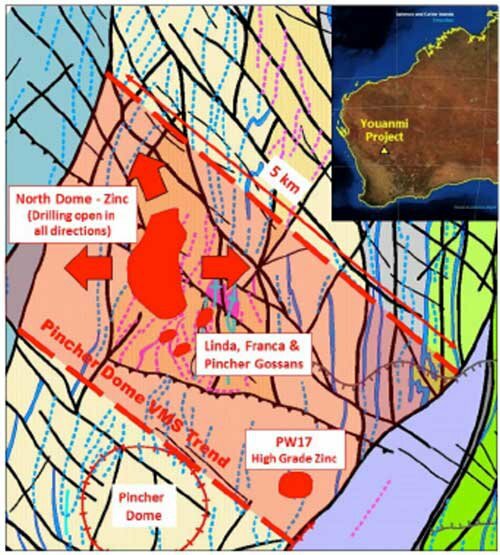 Today’s little known ASX listed metals explorer has several West Australian projects on the go and is drilling for gold-copper and zinc right now. Its flagship Youanmi Project sits on the Youanmi Greenstone belt, home to a number of Vanadium and zinc deposits, and a number of high quality exploration targets which have captured this ASX stock’s attention. The company has assembled a strong strategic tenement holding, and has significant resources and exploration targets covering more than 524km2 within this greenstone belt. At the same time, it’s worth noting that this is an early stage play and a speculative stock – investors should seek professional financial advice if considering this company for their portfolio. The upside for the company is that in this region has mostly been explored for gold – yet its priority targets feature copper, zinc, cobalt nickel and vanadium. Taking a truly diversified brush to its Western Australian commodities canvas, today’s company has a stake in prospective plays across all of these metals, as well as a recently added cobalt project, also within the Youanmi Project. And if that wasn’t enough, the company is also playing a long game, with two lithium tenement applications that abut Talison’s world-famous Greenbushes Lithium Tantalum Mine, and another gold play hosts a substantial JORC gold resource. There’s a lot going on with this company as it looks to capitalise on positioning and current macro events. 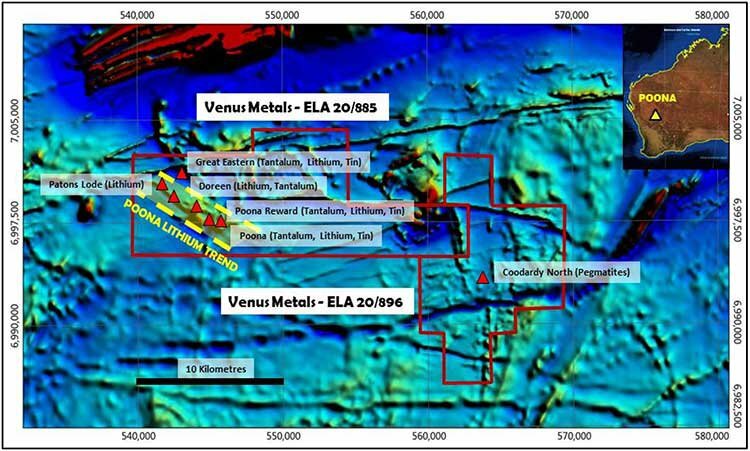 Venus Metals (ASX:VMC) holds a significant and wide ranging portfolio of Australian exploration base and precious metals assets containing lithium, cobalt, copper, gold, zinc, nickel and other platinum group elements including the element Vanadium that is also a battery material. The following map indicates each of VMC’s major projects across its base and precious metals and its lithium-tantalum assets. Given the current climate surrounding new energy sources and storage methods, VMC’s portfolio could have significantly positive ramifications, should the company be able to prove up any one of these projects. 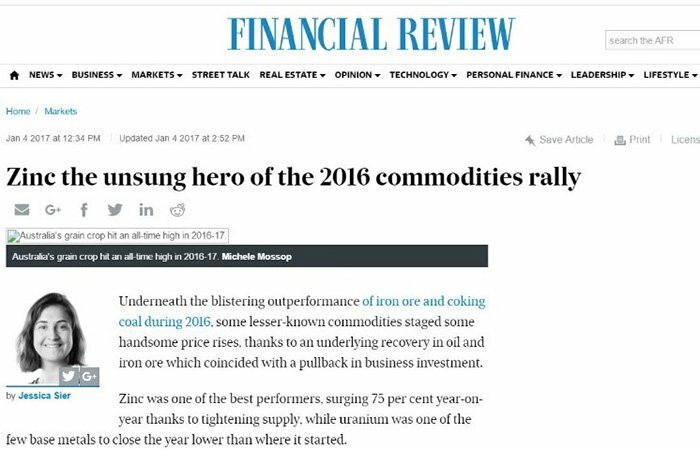 Let’s look at a couple of these commodities starting with zinc, to give you a snapshot of the markets VMC is hoping to crack. 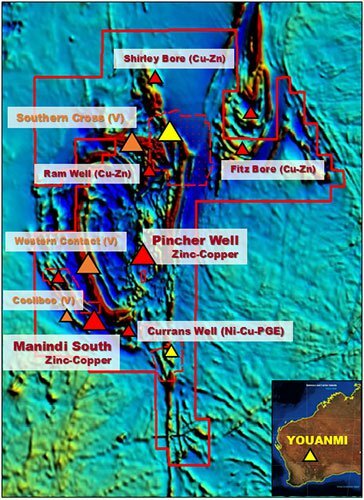 VMC is currently RC drilling for zinc at its Pincher Well Project, but we’ll get to that shortly. Let’s also take a quick look at the performance of cobalt. This upswing is great news for explorers like VMC, if they can find a cobalt project with significant mineralisation – which VMC appears to have done. So just by looking at zinc and cobalt alone, you get a sense that VMC is well positioned for a crack at future macro markets. However, commodity prices do fluctuate and caution should be applied to any investment decision here and not be based on spot prices or trends alone. Seek professional financial advice before choosing to invest. With that in mind, let’s now go into more detail. The following map indicates just how close these projects are to each other and to vital infrastructure and port facilities. The proximity of its projects has given VMC a strong foothold in the region and a significant landholding. The most prominent of which is its Youanmi Project. 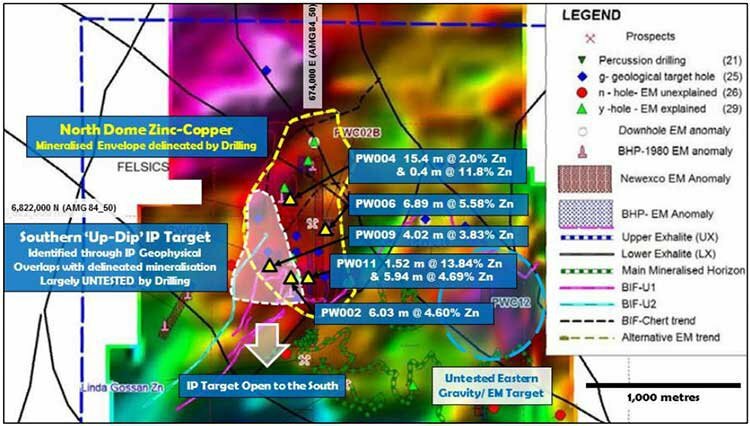 There is plenty of news flow around the Youanmi Project as its prospects — namely the The Pincher Well Zinc-Copper Prospect which the company has started drilling. As we alluded to in the intro, VMC holds an extensive strategic tenement covering more than 524 sq. kilometres of the Youanmi greenstone belt in the Murchison Mineral Field of WA. The belt, located 475 kilometres north-northeast of Perth, is host to a number of gold mines as well as deposits in commodities as diverse as copper, cobalt, zinc and vanadium. The good news for VMC is that this region has been subject to limited exploration since the 1990s, with most work up until that time biased towards gold. So with a broader outlook, VMC take an early advantage as it looks towards copper, cobalt and zinc. VMC’s ground runs across a number of key prospect areas that host significant resources or exploration targets. Now let’s take a look at each of these prospects to see exactly what is being uncovered. On April 3, VMC announced that it had uncovered significant cobalt mineralisation associated with extensive lateritisation at Youanmi — specifically at Currans Well. 94CUR0041: 5 metres at 586 ppm (0.06%) cobalt from 17 metres, and 6 metres at 552 ppm (0.06%) cobalt from 26 metres. 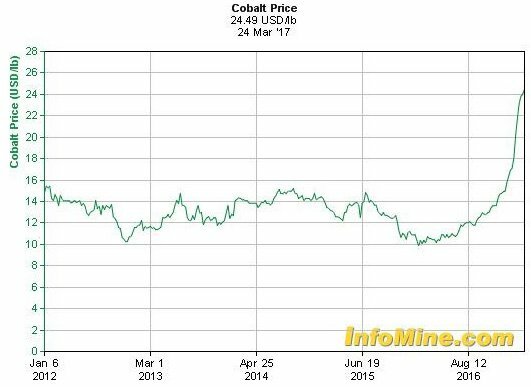 Yet there are many more historical drill holes still to be assayed for cobalt – so there may be more strong results to come. This cobalt mineralisation is associated with anomalous copper and nickel in the near surface environment, eluding to secondary enrichment. 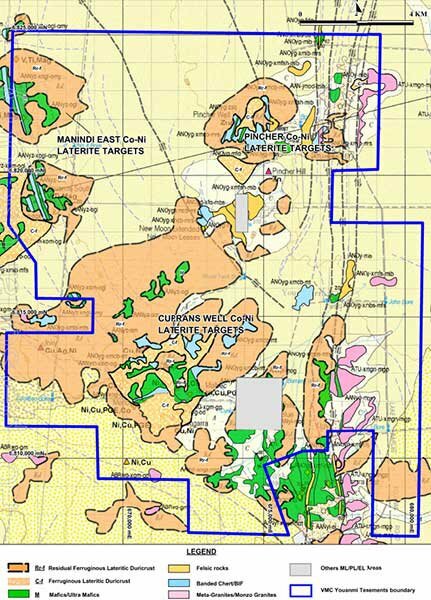 This geology at Currans Well compares well to the $480 million capped Clean TeQ Holdings’ (ASX: CLQ) Syerston Cobalt Project, where the surficial deposit hosted is within lateritic stratigraphy, overlying metal rich ultramafic rocks. As VMC studies the data on the cobalt mineralisation on its ground, and sets up a plan for RAB drilling, there are also solid drill results coming from its other prospects. Zinc is emerging as a bright spot in VMC’s portfolio too. The company’s Pincher Well Prospect, which also lies within the Youanmi Project, is one of three of VMC’s precious and base metals projects. It is located 15 kilometres southwest of the Youanmi gold mine and is a major focus of VMC within the greenstone belt. Strong results from a recent Induced Polarisation (IP) survey heavily supported the decision to drill for zinc. The survey identified significant shallow, ‘up-dip’ extensions to the south of the known North Dome mineralisation. We are looking forward to seeing what the drill bit can produce here, which shouldn’t be too far away given drilling is now underway. As you can see below, the Pincher Dome Volcanic Massive Sulphide (VMS) Trend is over five kilometres long and hosts a number of known zinc and copper prospects including a substantial body of zinc mineralisation at North Dome. PW009: 4.02 m at 3.83% Zinc from 58.46 metres. PW011: 1.52 m at 13.84 % Zinc from 93.57 metres. RC drilling commenced along two southern survey lines to test the highly prospective IP anomaly. Here you can see the IP survey lines with the highest response — possibly sulphide — showing on the southern survey line. Manindi (Inky) South Copper-Zinc Prospect where previous drilling has identified copper sulphide mineralisation and DHEM surveys note strong ‘off-hole’ conductors (15,600-26,225 Siemens). Southern Cross (Youanmi Vanadium), which has a JORC 2012 Inferred Mineral Resource 167.7 Million tonnes at 0.41% Vanadium (V2O5), 7.52% TiO2. 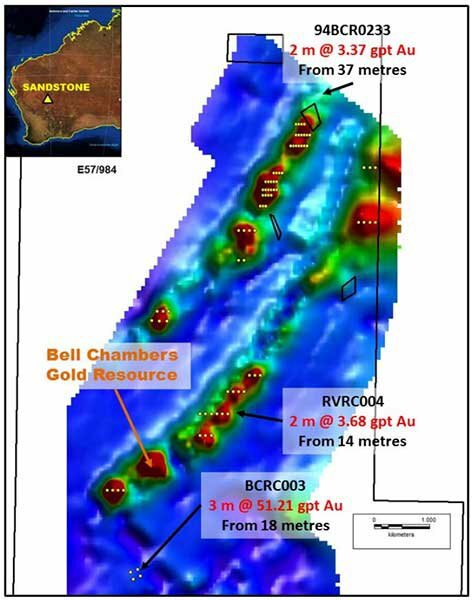 Located 23 kilometres from Sandstone in WA, on the western side of the Sandstone greenstone belt, the Bell Chambers Project hosts a substantial JORC gold resource with untested stratigraphic extensions over more than 10 kilometres of strike. The Sandstone region has produced in excess of 1.5 million ounces of gold and is well serviced by mining and regional infrastructure. Exploration to date has delineated a shallow JORC 2012 Inferred Gold Mineral Resource Estimate of 219,000 tonnes at 2.0 g/t gold for 14,000 ounces. RAB Drilling is being utilised to test key electromagnetic (EM) targets on the Sandstone Gold Project. BCRC003 3 metres at 51.21 gpt gold from 18 metres. 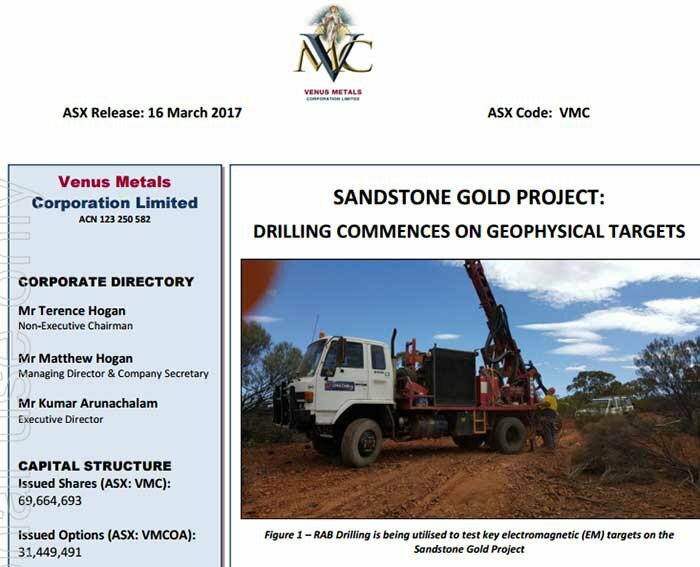 And now, modelling of the VTEM and exploration data shows a large mineralised gold trend at Sandstone, extending along two mineralised structures, each covering more than ten kilometres of strike. An airborne VTEM survey, flown by UTS Geophysics in April 2015, indicated several significant conductive trends and anomalies and defined an extensive mineralised trend hosting numerous targets requiring further exploration. Eight anomalies were prioritised for modelling to determine geometry, depth and conductivity. It is also worth noting that this isn’t the only copper-gold project VMC has. 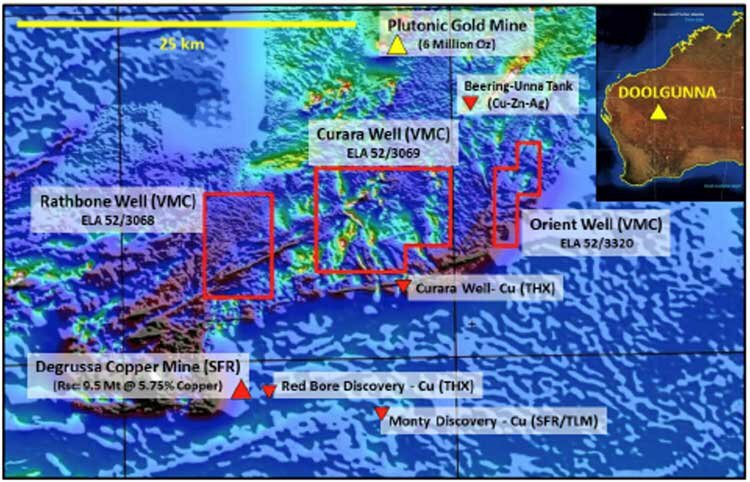 The Curara Well Project in Doolgunna shows the potential to host copper-gold and Nickel mineralisation with a number of ‘red bore-style’ breccia pipe copper targets having been identified. Broad Intercepts of disseminated Nickel Sulphides (Millerites) within the serpentinised Peridotites was reported in recent RC drilling. VMC holds six tenements covering over 164 sq. kilometres of the Marymia Inlier and are located approximately 10 kilometres northeast of the $1 billion capped Sandfire Resource’s (ASX: SFR) high-grade DeGrussa Copper Mine. Again, given the calibre of neighbours VMC has in this region, it would be buoyed by what is already being made evident at Curara. 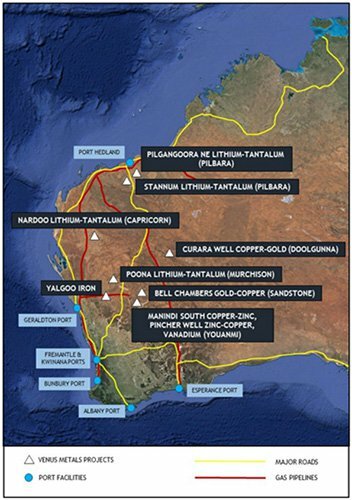 In addition to its highly prospective precious and base metals targets, VMC has five strategic lithium-tantalum projects areas in Western Australia. 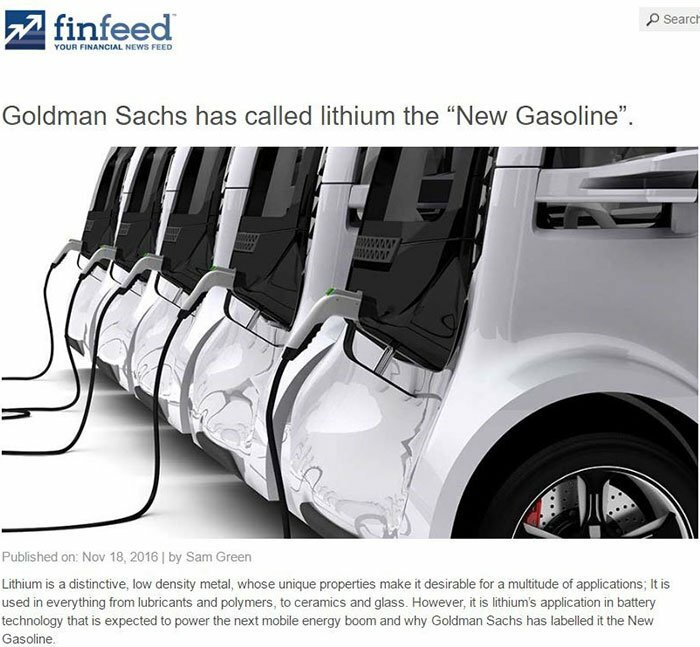 You would have heard the lithium story by now. 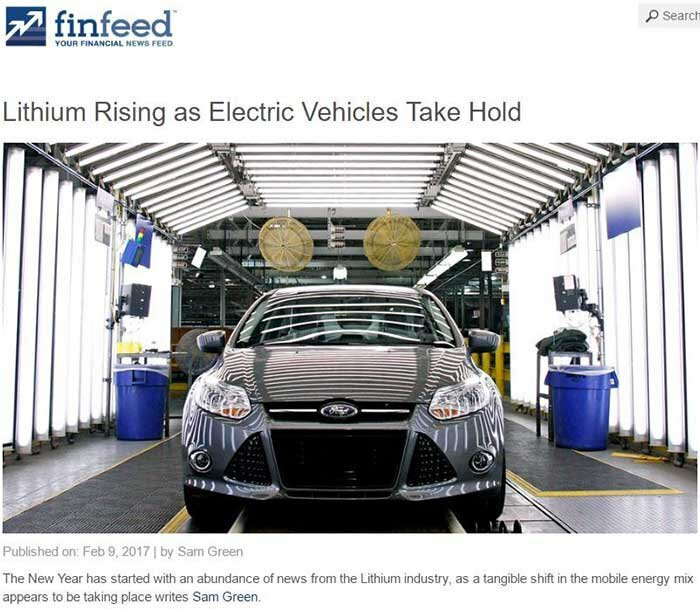 Lithium exploration and mining is being driven by the electric vehicle evolution and has thus seen a raft of explorers enter the fray. ...give you an idea of just how important lithium is to our future energy requirements. VMC may not have been the first to get on board here, but it looks to have a solid foundation. 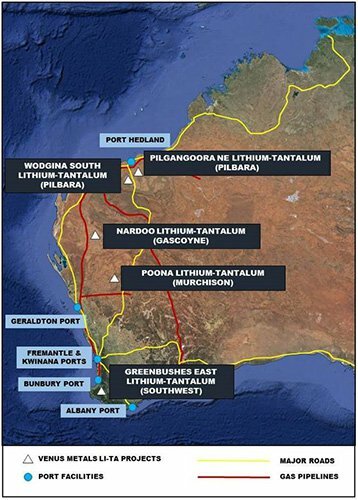 The Poona application covers a number of known lithium-tantalum prospects including Patons Lode and Poona Reward and was recently extended to include the Coodardy North prospect. Further to this, rreconnaissance sampling and mapping has identified a number of drill targets for future testing. Recent RC drilling has returned significant Lithium mineralisation from surface. The Pilgangoora North-East area, covering 350 sq. 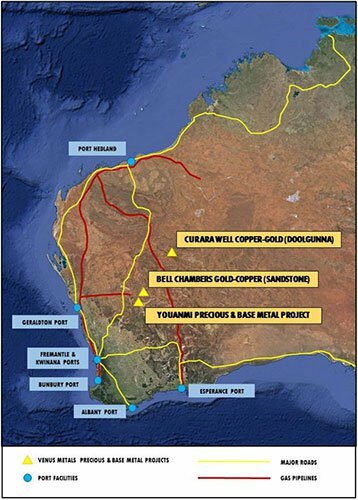 kilometres, is located close to the $555 million capped Pilbara Minerals’ (ASX: PLS) Pilgangoora deposit. VMC has two tenement applications covering a number of recognised tantalum and precious metals occurrences, which are being explored by VMC under an ‘MOU’ with Lithium Australia (ASX: LIT) – a company which regular Next Mining Boom readers would no doubt we aware of. LIT has been one of the region’s success stories and under terms of the MOU, LIT will explore the tenement area and share its lithium metallurgical processing technology known as SileachTM. This is very good news for VMC as it puts it within arm’s length of Pilbara Minerals, who last year agreed to establish a joint venture that investigates the suitability of LIT’s SileachTM process to produce high-value lithium carbonate. 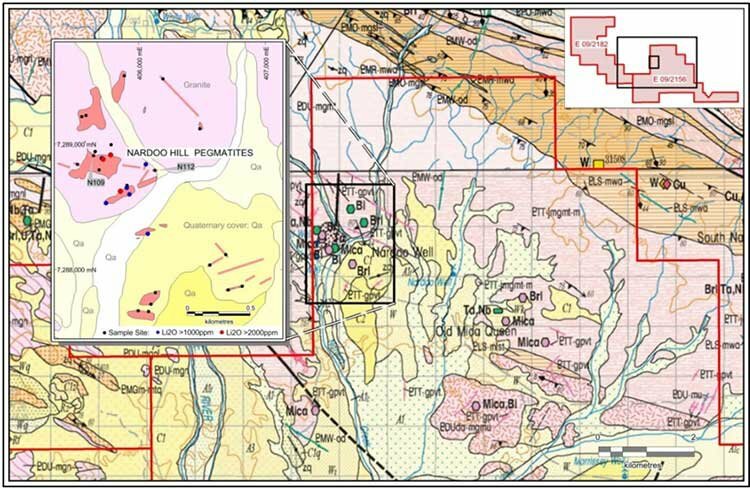 Also in the Pilbara is VMC’s Wodgina South Project, located to the south of the Wodgina tantalum mine, which hosts a number of tantalum-lithium-tin prospects with initial sampling returning results in excess of 0.65% Li 2 O. These tenements are also covered under the MOU with Lithium Australia and will see LIT follow up on targets in coming months. The Nardoo project in WA’s Gascoyne region overlies two historical mining centres, Nardoo & Morrissey Hill. The project covers over 190 sq. kilometres and a number of known lithium-tantalum occurrences including New Well, Morrissey Hill, and Nardoo Hill. 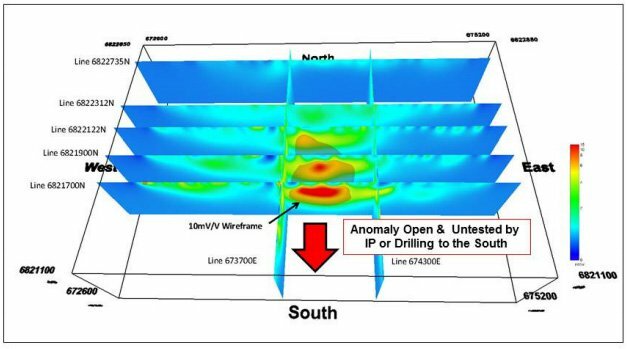 Lastly, VMC has two tenement applications over an extensive area of recognised intrusive stratigraphy at the Greenbushes East Project. The Project, in the southwest of the state, covers an extensive area of intrusive stratigraphy adjacent to Talison Lithium’s world class Greenbushes Lithium-Tantalum mine. Preliminary testing on two key geographical targets will commence once the tenements are granted in the coming months. As you can see, VMC has an extensive suite of projects. It’s extremely well positioned to take advantage of the growth in the use of rechargeable batteries and to capitalise on the growing need for batteries materials. However, as stated this is an early stage play and investors should take a cautious approach and seek professional financial advice if considering this stock for their portfolio. Additionally VMC’s portfolio of base and precious metals assets will provide stability that comes with having diversified commodity projects and offers more flexibility to adjust future production around movements in commodity markets. With a number of drilling projects underway, we expect significant news flow to come through in coming months. Positive assays from these drills could underscore the potential of VMC’s assets and prove to be a significant catalyst for the company moving forward.